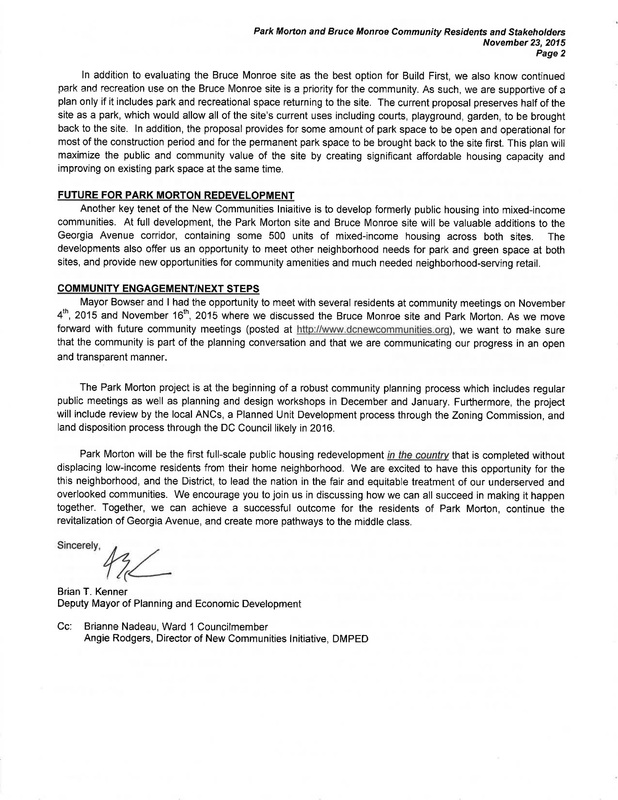 Park Morton Planning & Design Workshops Begin Tonight, and Open Letter from Deputy Mayor Kenner | Park View, D.C. The first of two community planning and design workshops for the Park Morton redevelopment is scheduled for tonight beginning at 6:30 pm. 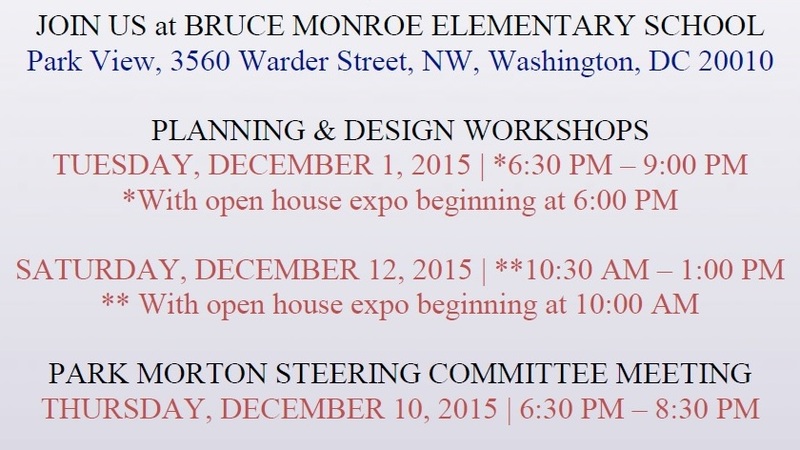 The meeting will begin with an open house expo beginning at 6:00 pm at the Bruce Monroe @ Park View school. Future meeting dates, times, and locations are below. 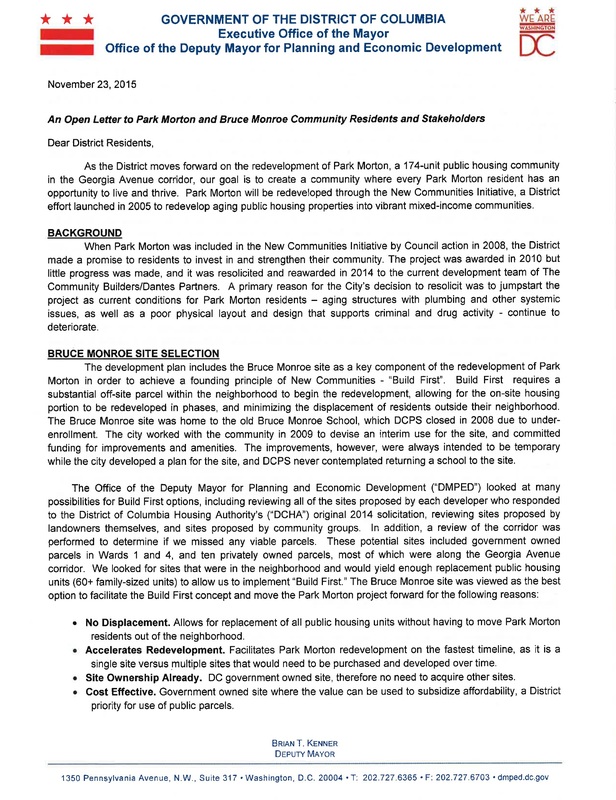 Also related to the redevelopment of Park Morton, Deputy Mayor of Planning and Economic Development Brian Kenner distributed an open letter outlining some of the background, addressing the selection of the Bruce Monroe site, and providing information on community engagement and the next steps of the redevelopment process. The letter is below, or you can access a PDF version of the letter here. This entry was posted on December 1, 2015 at 7:01 am and is filed under Development, Housing. You can subscribe via RSS 2.0 feed to this post's comments. I don’t believe it’s possible to fit basketball courts, tennis courts, a playground, a community garden, and 200 units of housing on Bruce Monroe. When will they show us this proposal? Why aren’t they telling us which other parcels were looked at? Why did they only look for individual parcels that could handle all 60 replacement units, rather than splitting the units among multiple Georgia Avenue parcels, if that was the sticking point? The lack of transparency on the process so far has been appalling. It really looks to me like the mayor is giving away a valuable parcel to a connected developer, and these meetings are being used to give the process a veneer of community involvement. Well, in re: the multiple parcels along Georgia, he makes the point that this would require potentially acquiring multiple parcels that would need to be developed separately, potentially slowing the process. Sure, but that argument doesn’t pass the sniff test. The strategy of “build first in one parcel” is the same strategy they’ve been using for over 10 years, and it’s the reason they haven’t delivered a single project in all that time. They need to be creative. Instead of picking a fight with a bunch of neighbors who weren’t even involved in this process before, which will definitely slow things down, they ought to figure out how to get Park Morton residents better apartments soon. Why not buy 20 units each in the 3 big projects Zuckerman is planning? Why not buy units in the Gibson, or the Swift? Why not add some units to the Hebrew Home? Why not take the used car lot, the chicken place, and the dental thing? When a billionaire needs a new stadium the city figures out how to get it done quick. When 100 poor families need new apartments, the city screws around for 10 years and then decides the only solution is to tear down a popular community park? At the same time they are spending $50M to build parks in NOMA? It just doesn’t make sense. I started off moderately opposed to the building on the BM site but have had a change of heart if this will fast track the PM redevelopment and if they can permanently designate half the site an official park making it much more difficult to take away in the future as Kent mentioned in a previous post. How about this idea: 1) sell Park Morton to the highest bidder for redevelopment of only market rate apartments; 2) all of the property tax income generated by the new development goes directly into vouchers for people to use wherever they want; 3) Don’t touch the park.